The lavender field in Furano-city, Hokkaido is also famous worldwide, and many tourists also visit from foreign countries. Lavender blooms from the end of June by something early and meets the golden age in the middle of July. It's the time that a carpet of the most beautiful lavender can be seen. 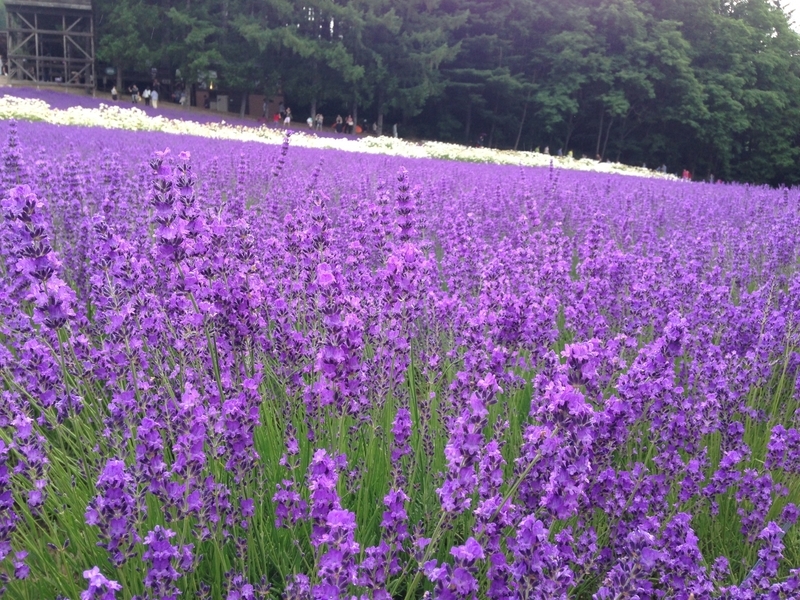 Refinement, a potpourri and a dry flower can enjoy lavender by the various shapes at Furano. There is something of white and pink in a flower of lavender by the kind, but blue purple is general. Blue purple of lavender is equivalent to "the wisteria purple color" by the Japanese name which means the traditional color of Japan. The wisteria purple color is a thing of light blue purple like Fuji's flower. Purple indicates the strong color more than light purple by the color name with which light purple very popular with a lady and the purple which is a symbol with the high color were combined from the Heian Period. Because it's often seen by literary work in the Meiji period and a painting of beauties, the wisteria purple color is said to be one of the color names which represent Meiji culture. When the color and the fragrance can be enjoyed, the soft ice cream, the sweets and the drink in Furano where a lavender extract has been added are here and are popular from a tourist, too. Lavender is the refinement used most frequently in aromatherapy. It's called all-around refinement because a stimulus is used for various purpose, and also gentle. There are a subsidence action and an action which makes a nerve become stable in lavender. When a seat including the fragrance of the lavender is stuck for 30 minutes by a study of Tohoku University, there is a report that a parasympathetic nerve became predominant. When relaxing by one of autonomic nerves, the nerve which becomes predominant is called a parasympathetic nerve. The tension of the whole body is relieved by making the parasympathetic nerve predominant, and it becomes inexpensive about a sleep. The fragrance of the lavender is recommended to the person who sleeps badly and the person who would like to relax. Before sleeping, a parasympathetic nerve will burn an aroma, and just has lavender tea daily, and is predominantly, and it's possible to relax.